Sloshsat-FLEVO is aptly named: slosh for the movement of water, sat for satellite and FLEVO, the project's acronym: Facility for Liquid Experimentation and Verification in Orbit. Flevo is also the name of the latest province in the Netherlands to be reclaimed from the sea, and one of the sites of the Dutch National Aerospace Laboratory (NLR), the main contractor for this project. The cube-shaped Sloshsat-FLEVO is a mini satellite with a mass of just 129 kg. It will be launched on top of the cylinder-shaped Maqsat-B2 structure and placed in the lower passenger position under the Ariane 5 fairing. This joint project between ESA's Technology Research and Development Programme and the Netherlands Agency for Aerospace, is funded mainly through ESA's General Study and Technology Programme. Sloshsat is designed to investigate fluid dynamics in microgravity conditions by monitoring the behaviour of 33.5 litres of deionised water, placed in a tank onboard the small satellite. The composite tank has 270 sensors to measure the water's distribution. Other sensors will measure the temperature, pressure and fluid velocity at 17 locations, and six accelerometers and three fibre-optic gyroscopes will monitor the spacecraft's motion. Thrusters, powered by a cold gas nitrogen system, will provide linear and rotational movement to increase and control fluid motion. This is the first time that a satellite has been dedicated to studying fluid behaviour in weightlessness. Spacecraft transporting supplies to the International Space Station, carrying out repairs to disabled communication and observation satellites or heading for other planets, often carry large quantities of fluids onboard in the form of propellant or water. This is why it is important to fully understand the effect a liquid's movement can have on the attitude control of these spacecraft. Many fluid dynamic models exist, as well as computational fluid dynamics (CFD) software, but to date the effect of sloshing on spacecraft control has been difficult to predict for real situations as it has not been validated. Jan Vreeburg of NLR, the Principal Investigator for Sloshsat says "once the satellite is in orbit, scientists will be able to verify and validate existing models." This will allow them to design new CFD numerical algorithms and liquid management systems for spacecraft. As well as testing the effect of liquid movement on the attitude control of a spacecraft, Sloshsat-FLEVO will also test the effect of spacecraft manoeuvres on liquids. "For example," reports Vreeburg, "tests will show us how best to manoeuvre a spacecraft to move the liquid in a tank near to the exit hole; this has to be done carefully to avoid 'ingesting' bubbles. Once thrust is generated by the engine, its action generally keeps the propellant at the exit hole." 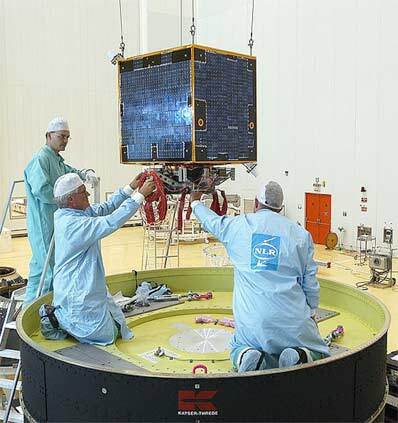 Sloshsat-FLEVO has been installed inside the Sylda 5 multiple payload deployment system at Europe's Spaceport in French Guiana since the end of August. On top of the Sylda is another passenger bound for space, an XTAR-EUR telecommunications satellite. ESA's spring-loaded ESAJECT mechanism, developed and built by the Belgian company Verhaert for 50 - 150 kg satellites, will eject Sloshsat-FLEVO once the launcher reaches geostationary transfer orbit. The satellite will then transmit data on the behaviour of the water in its tank under different motions controlled from the ground, for a minimum of 14 days. The total experiment time will be about 24 hours and last until the gas supply of the reaction control system is exhausted. Between experiment runs the water is allowed to settle and the battery will be recharged using solar panels.